click image for close-up American artist Thomas Sully painted this portrait of Fanny Kemble one year before the young actress married Pierce Butler. 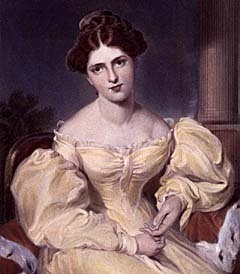 Like Fanny Kemble, Sully came from a theatrical family and even performed onstage with his parents and siblings. His ambition soon after turned to painting -- an ambition that would lead him to become, for a number of years, the leading portrait painter in the U.S.
Sully's subjects included prominent politicians and military heroes, but he became known mainly for his paintings of society women. In 1837 he was sent to England to paint Queen Victoria.